Would a contextually adaptable Move get you interested in motion controls again? Just when you thought game developers had moved on from throwing motion-based game devices at your feet, hoping you'll pick them up and get off the couch, Sony may be jumping back in the ring. The PlayStation-maker has patented a new Move controller that could overcome one of the motion controller's biggest hurdles, context. The modular PS Move controller would allow users to attach or remove block-like components to approximate the feel of commonly-used gaming tools. 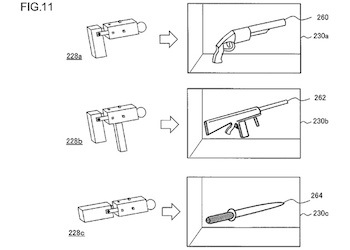 As you can see, some of the potential shapes Sony envisions include a shotgun, an assault rifle and a sword. Presumably there might some non-violent alternatives but then those are probably what we'd use it for most of the time. Obviously, there's no telling whether or not Sony's actually interested in diving back into the Move market. There are many steps between filing a patent and shipping a product. As Engadget points out, Sony seems to be perfectly content leveraging the DualShock 4's ability to mimic the Move's motion-based functions, which developers can use without worrying about a splintered install base. If they could get players interested, though, Sony could make a fortune selling each of those "Move-Blocks" to players, piece by piece.